Amy's Creative Pursuits: A New Re-Decorating Project! My husband and I have lived in our house for over 25 years. When we first bought the home, we gutted every single room and redecorated them, then we built a 1200 square foot addition. After that, I went back to work for six years, and the house renovations and upkeep ended. Since I "retired" three years ago, I've been slowly working going back through the house completely redecorating some rooms and doing minor updates in other. Last year we renovated our master bedroom, and the year before that we did created my beauty room. This year, it's time to redecorate my daughter's old bedroom. When you live in a home a long time, your needs for each room in your house change. So when it came time to redecorate some of the rooms in my house, I had to first take into consideration "How will the room be used now in this stage of our lives?". My daughter married and moved out of our home six years ago. Her room is primarily used now as a guest room and also for seasonal clothing storage. My daughter and her husband are the guests who use the room the most so I asked her "How can I design this room to fit your needs when you come to visit". She replied, "Plenty of floor space to put a small crib, a place to put folded clothes, and a place to put dirty clothes". Now that I had my use for the room identified and I knew what the special needs were, it was time to peruse Pinterest for some interest. 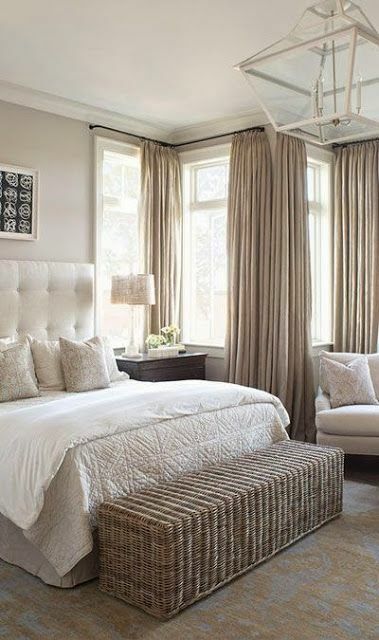 Below are some bedrooms I pinned to my For The Home board that I really like because of the color and style. Keep in mind, that my bedroom is only a fraction of the size of these rooms, I'm looking at colors and styles only. After years of living in a jewel-toned house, I love the idea of neutral walls and furniture and bringing in accent colors with pillows and blankets. 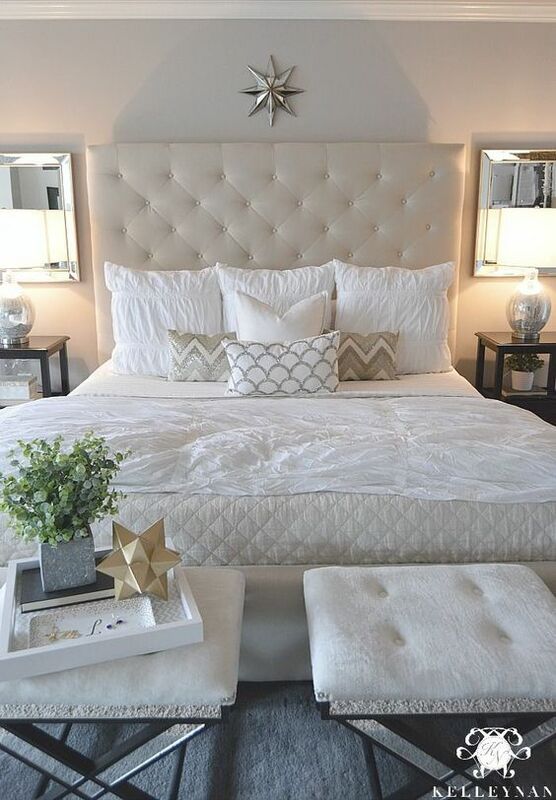 I love upholstered headboards and purchased one for my own bedroom. I think I will purchase another one, but this time buy a beige or off-white one instead. 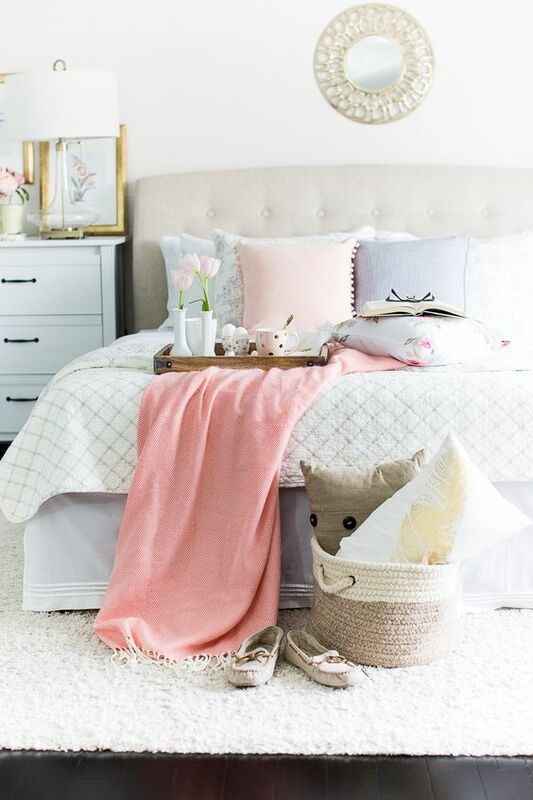 I want to keep everything in the room a mix of whites, creams, and beige's and only bring in color with accent pieces and some dark wood furniture. The hallway leading to the guest room has peachy tones, so I was thinking this soft, muted pinky/peach color would make a great accent color. 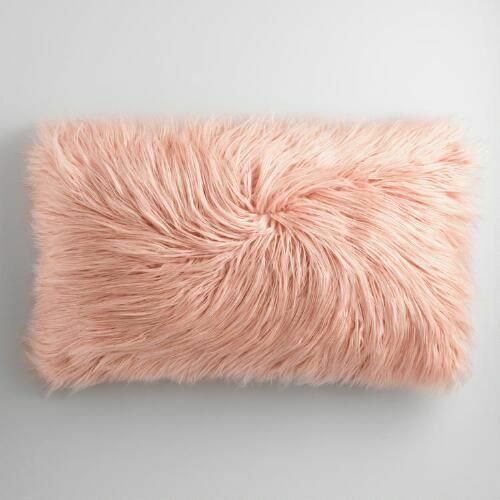 I love fur pillows, and this one would not only bring color into the room, but texture as well. 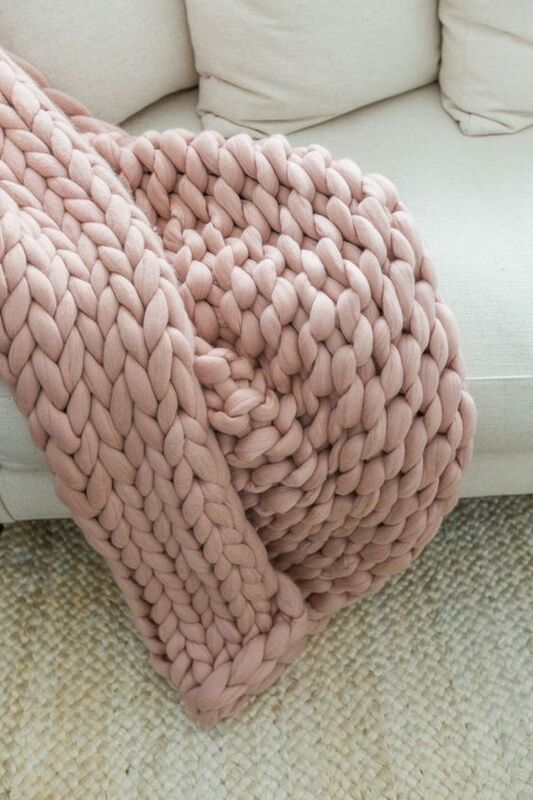 I love this chunky knit throw too! Isn't it fun? I will be on the hunt for some type of bench or settee that could be used for both storage and/or a place to put a suitcase on top of. This one is awesome! It brings so much texture into the room. And I'm crazy for those floor to ceiling drapes! Love the color of the drapes too! And now that you've seen all my inspiration pictures and what I hope to do in the room, here are some pictures of what the room looks like now. It was Christmas when these photos were taken, hence the Christmas decor. The room was painted a very dark red with white trim. The floor is nothing but painted floor boards. Toile material was used for the window drapes, closet drapes, and bedding. The furniture consisted of a queen size daybed, an old sewing machine used as a table, a floor lamp, and a chair. The decor has a 'Paris' theme, which I will be keeping, but everything else is going! I will be making a bed skirt with the striped material, and keeping the toile comforter, and one or two of the pillows. I'm not sure if I will be keeping the toile bulletin board. Time for an update, right? Yikes, I'm embarrassed to even show you these pictures! I think you can also tell why I want to leave the dark jewel tones behind and open up the room with clean, bright neutrals! I painted the room dark because back then it was all the rage to paint small rooms dark colors to make them seem more cozy. Now it just seems like spending time in this room is like being in a dark cave...nothing cozy about it! Amy, I am so excited about your project! One of my tasks this year is to revamp the room which we've now designated the guest room. I want it to feel beautiful - it's anything but right now as we've parked the cat's litter tray in there! You're way ahead of me so I'm going watch this project series with much interest as you did such a super job with your master. Hugs, x.
haha! that is so funny that you put the cat's litter tray in there. I felt the same about this guest room. The dark paint and all the clutter made it very uninviting to guests. You picked some really pretty inspirational pictures. Love those colors too and how they brighten up a room. The peach-y color is such a nice accent color and something I am drawn to right now as well. Good luck and lots of fun with the re-decorating process! Thanks Ellie! I think the peachy accent color will tie in well with my beauty room and the peachy hallway. I really like the color too! Hi Anna! Yes, it is super exciting! I love redecorating once the grunt work is over and I can do the fun stuff! Thank you! Isn't that blanket so neat? Such cute inspiration! Redecorating a room is always so much fun! Thanks Shannon...it is! I'm loving the results so far! I love your inspiration photos! Cannot wait to see how it turns out. I cannot wait to see the finished product! The first room image is my favorite inspiration you picked! Isn't that room gorgeous? I love all the windows and light! Thanks Shauna! Oh, kitchen and bath remodels are the worst! We need a new countertop in our kitchen and my husband won't do it because he says its too much work. We also need out shower/bath stall re-done. He keeps putting that off too! I'll keep working on him...one room at a time! Wow that is going to be such a change! I love the light airiness of those inspo pictures! Thanks Ruth! I changed the paint color and it's already quite the change. I can't believe the difference! The room seems so much lighter and brighter now! Oh I love all the inspiration! Can't wait to see how it is going to turn out! I love the inspirational pictures, especially the floor to ceiling drapes & throw. Can't wait to see the makeover. Thanks for sharing on Sunday's Best. Thanks Rhonda! I can't wait either!